It all started with an Open House. In May of 2002, Tim Hewitt and his family came to Onawa, Iowa with the intention of starting an indepent, fundamental Baptist church. At that time there was no Baptist church of any kind in all of Monona County, which consisted of about 10,000 people. Their plan was to invite the whole town out to an open house to see the New Baptist Preacher in town. So on Saturday, May 11th, twelve people showed up. They were so impressed with the turn out that they scheduled their first service that next Sunday. On Sunday May 19th, they were further shocked to have in attendance 27 people. Out of that group of people eleven were considered good prospects with wich to start a Baptist church. "We could never have expected to see such blessings for our very first Bible study. What a wake up call to our lack of faith." So Pastor Hewitt and his family labored to teach their new prospects what a Baptist really is and what they believe. God blessed them in the months to come with new vistiors and a couple of families that attended faithfully. 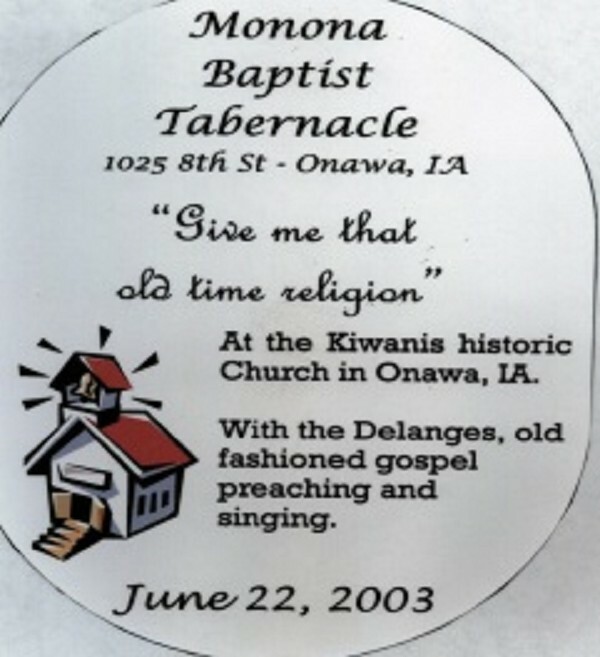 They soon aquired a building to rent for roughly $300 a month and named their meeting place Monona Baptist Tabernacle. 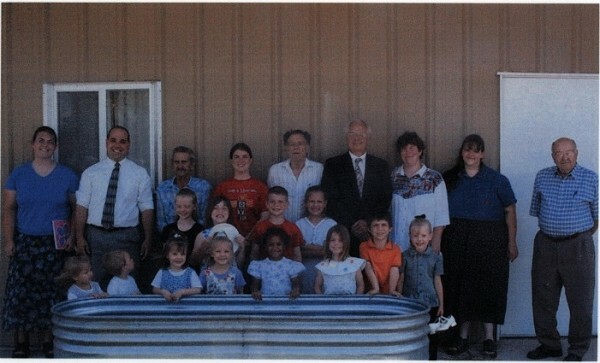 By December of 2002 they saw their first soul saved. Soon, others came to faith as well. To get more prospects, Pastor Hewitt got the church involved in various avenues such as working in a fair booth, passing out tracts in the 4th of July parade, putting on a vacation Bible school, and even adopting a highway. After much hard work the church was seeing some stability with a couple of rock-solid members. That Summer also proved to be very prosperous. Their VBS had 35 kids in attendance. Later the church hosted its very first MVCIB Preacher's meeting with several pastors attending. Then they went to their first youth camp, taking three of their young people with them. The very next week they also brought in an evangelist and held an old-fashioned meeting in an old church building in town. They saw several vistiors and even one man was saved. But often times in the work of the Lord, success is followed by hardship. By the end of the summer three of the four families that had been coming faithfully left the church over the biblical stands that Pastor Hewitt took. But the church kept plugging away at the work, looking for every oppertunity the Lord would give them to give the Gospel. Praise the Lord for Bro. Hewitt's faithfulness to God's Word. By early 2004 God had opened the door for Pastor Hewitt to work in the jail as a chaplain to the inmates. One man was saved as a result of that ministry and started coming to church. Throughout the year Bro. Hewitt challenged the church to be faithful to give out gospel tracts. Most of the members got involved and even began knocking doors to reach people for Christ. He also challenged them to be faithful in giving to missions. 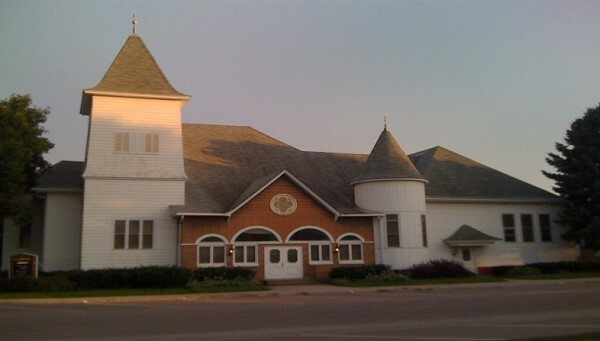 The church followed their pastor's leadership faithfully, even to the point of desiring to pray with him daily that the ministry in Onawa would go forth successfully. The next year the church took some steps towards spiritual growth. They had a great missionary conference in March and as a result they more than doubled their missions giving. Later in the year they had a revival with Bro. Joe Decker and a musical group called Witness, from Heartland Baptist Bible College. It was a time of great spiritual growth for the church. In the summer Dr. Gene Howard, a John Wayne look-alike, came and attracted several people to the church to hear a clear gospel presentation. During that meeting a lady came forward to recieve Christ as her Savior. But before the summer had come to a close, Pastor Hewitt and his family felt the call of God to go Asia as missionaries. The young church would be in need of another pastor soon. "Where once there was no light in Monona County, there's now a church, with a burden to reach the lost..."
For the next nine months the church went without a pastor. For a time Pastor Reggie Moffett of Omaha, Nebraska filled in as the interrum preacher while waiting for another pastor to take over. But the the strain of pastoring two churches became overwhelming. So he regretfully stepped down and turned the church over to Pastor Dave Lydick of Bellevue, Nebraska. Bro. 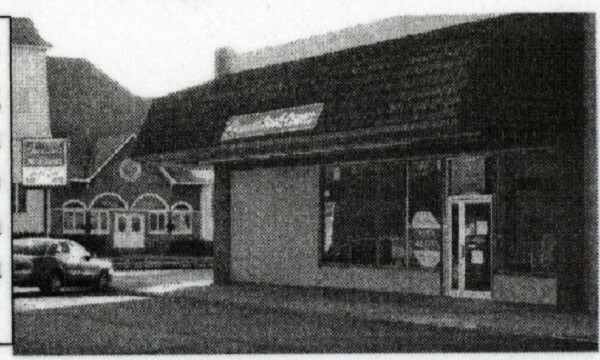 Lydick provided the help the church needed by sending an interum pastor, Dan Dill, from his own church, who preached faithfully and encouraged the church to keep the faith. But the church needed a pastor who could be there full- time. So as providence would have it, in the summer of 2006 God began to stir in the heart of Pastor Reggie Moffett to challenge his assistant pastor, Matt Sperling, to pursue a full-time pastorate. Bro. Sperling then sought advice from several different pastors on what he should do. Every bit of cousel seemed to be pointing to Onawa as place God would have him pastor. By June of 2006, Matt Sperling, convinced of God's call, moved his family to Onawa to take the role of the pastor.